The history of the organization of critical care medicine mirrors the evolution of modern medicine as it has evolved into the management of acute illness. This acute, highly specialized care is provided by anesthesiologists, surgeons, and internists, and its origins can be found within these specialties. 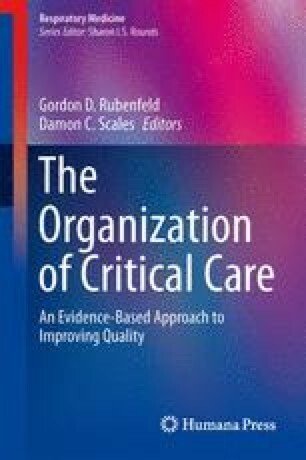 Critical care medicine is often associated with complex life-saving treatments, and thus we can track the origins of critical care medicine to the treatment of respiratory failure with mechanical ventilation, severe infections to antiseptic treatments and antibiotics, and cardiovascular insufficiency to hemodynamic monitoring and pharmacologic support. But critical care medicine embodies more than a collection of treatments. It is a health care delivery process demanding specially skilled health care providers (physicians, nurses, respiratory therapists, pharmacists, and physical therapists) within an organizational framework that titrates often conflicting treatments, minimizes potential treatment errors, and promotes the safe and efficient application of appropriate and timely care. Parker S. Joseph Lister (1827–1912). 1997. http://www.surgical-tutor.org.uk/default-home.htm?surgeons/lister.htm~right. Accessed 31 July 2006.